A tropical tree from West African rainforests, Cola nitida is best known for its caffeine-containing seeds, known as kola nuts. Raw seeds are chewed as a stimulant and have a bitter taste. Kola nuts are used in a variety of local ceremonies and also to produce kola nut extract, which is an ingredient in some soft drinks. The closely related species Cola acuminata is also sometimes known as kola nut, and its seeds are used in the same ways. Cola nitida and C. acuminata are known as 'true kolas', yielding superior seeds for chewing. Although seeds of some other Cola species are suitable for chewing, they are of an inferior quality and are known as 'false kolas' or 'monkey kolas'. 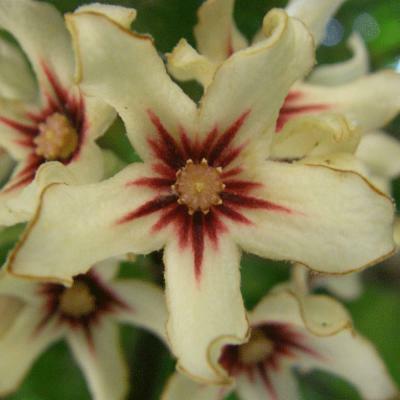 Cola nitida is native to West Africa (from Guinea to Ghana) and has been introduced throughout the forested areas of West and Central Africa. Commercial crops are grown mainly in Nigeria, Ghana, Côte d'Ivoire and Sierra Leone and also to some extent in India, Brazil and Jamaica. 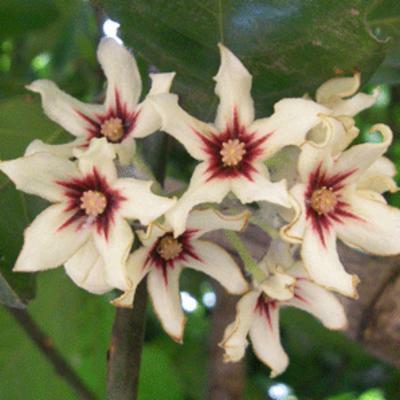 Overview: Evergreen, tropical tree growing up to about 20 metres tall, with a spreading, open canopy. Leaves: Oval with pointed ends, leathery, with a shiny upper surface. Borne alternately on the stem. Flowers: Off-white to cream, star-shaped with five petals and a blotched red-purple centre with a prominent stigma. Pollinated by flies. Fruits: Large (13×7 cm), knobbly, green pods. Splitting into two equal halves to reveal four to eight, smooth, red or white, seeds (kola nuts). 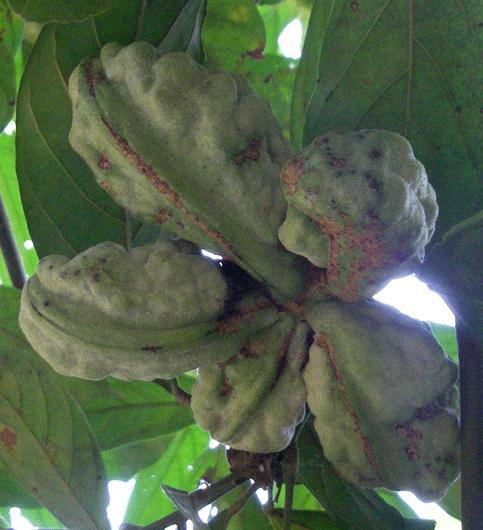 Kola nut extract was reportedly used as a source of caffeine in pharmacist John Pemberton's 'French Wine Coca', a forerunner of the soft drink Coca-Cola. Frank M. Robinson's first advert for Coca-Cola in the Atlanta Journal on 29 May 1886 read 'Coca-Cola ... containing the properties of the wonderful Coca plant and the famous Cola nut.' Natural kola nut extract has now been replaced by synthetic citrate caffeine in many leading brands of cola drink, although some advertised as 'natural cola' include kola nut in their ingredients. 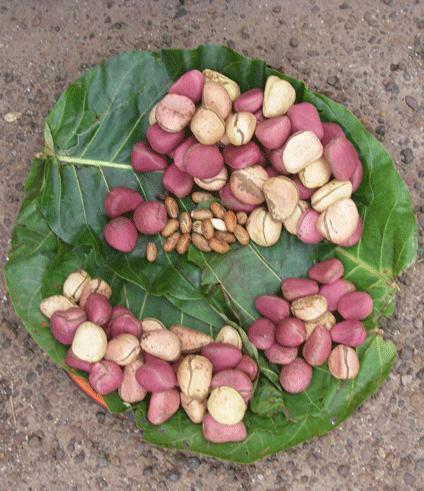 Kola nuts are used in many African ceremonies, for example the welcoming ceremony of the Igbo culture of Nigeria. The seeds are passed among visitors to a village and then blessed by the village elder, before a seed is given to each visitor with the words ' Öjï luo ünö okwuo ebe osi bia ' ( When the kola nut reaches home, it will tell where it came from ), proof to the visitor's people of his visit to the other village. 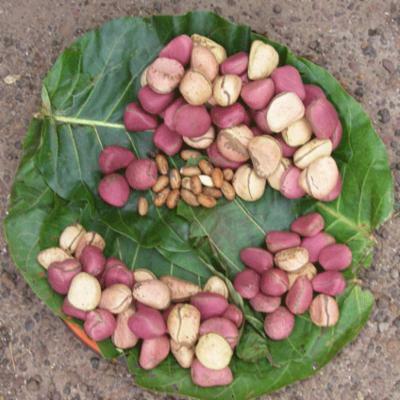 Kola nuts are central to many other ceremonies in western and central Africa including marriage, child naming, investiture of tribal chiefs, funerals and sacrifices to deities. Seeds from Cola nitida and C. acuminata have been used in western African and Anglo-American herbal medicine as an antidepressant. They have also been used to treat headaches, migraine, dysentery and diarrhoea. In Africa, C. nitida bark is used to treat wounds and swellings, roots to make teeth-cleaning sticks, and pod bark mixed with other ingredients to reduce labour pains. In the past, kola nuts have been given to troops on African battlefields, with the aim of enabling prolonged exertion without fatigue or thirst but also preventing dysentery and even supposedly giving rise to a feeling of bravery. Further research is needed to verify the medicinal properties of Cola nitida . Cola nitida seeds are also used for dyeing, water purification and production of liquid soap and fertilisers. 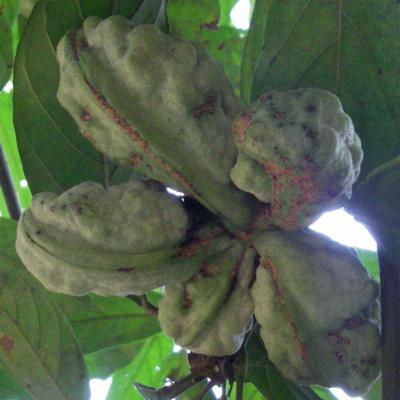 By-products of kola nut processing are used as poultry feed. Its timber is used for furniture and as fuelwood. Outside the tropics, Cola nitida should be cultivated in a greenhouse at 21-28°C with high humidity. It requires a deep, fertile growing medium and regular watering. Adequate drainage is important as C. nitida does not perform well in waterlogged soil. Propagation can be undertaken by cuttings, air-layering or sowing of fully ripened seeds. It can be grown in open or partially shaded sites. A young specimen of Cola nitida can be seen growing in the south wing of Kew's Palm House. 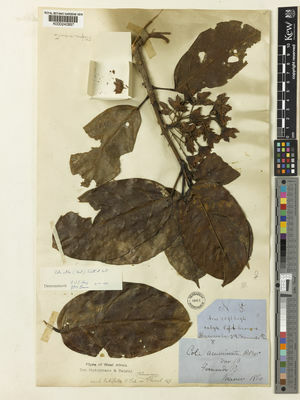 Dried and alcohol-preserved specimens of Cola nitida are held in Kew's Herbarium, where they are available to researchers by appointment. Specimens of Cola nitida wood are held in Kew's Economic Botany Collection, where they are available to researchers by appointment. Lowland rainforest; usually in rich, deep soils. Not assessed according to IUCN Red List criteria (although many other Cola species are of conservation concern). Seeds contain caffeine, a stimulant with a range of side-effects. 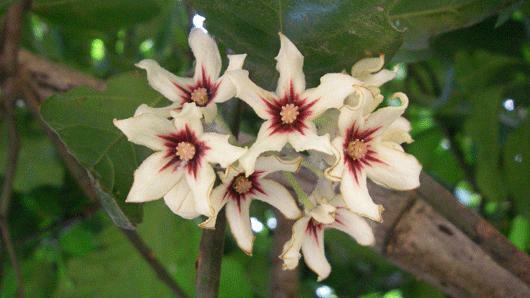 Flowers cream, usually with dark reddish markings within. Often cultivated, but native only as far east as the Gold Coast, introduced elsewhere. Food (stimulant), flavouring for beverages, ceremonial rituals, medicine. Central African Repu, Dominican Republic, Guinea-Bissau, Trinidad-Tobago, Windward Is. Lim, K. T. (2012). Edible Medicinal and Non Medicinal Plants: Volume 3: Fruits. Springer, UK. Widjaja, M. (2012). Insight into Igbo Culture, Igbo Language and Enugu. Vaughan, J. G. & Geissler, C. A. (2009). The New Oxford Book of Food Plants, 2nd Edition. Oxford University Press Inc., New York. Mabberley, D. J. (2008). Mabberley’s Plant-book: a Portable Dictionary of Plants, their Classification and Uses, 3rd Edition. Cambridge University Press, New York. Barwick, M. & Van der Schans, A. (2004). Tropical & Subtropical Trees: A Worldwide Encyclopaedic Guide. Thames and Hudson, London. Burkill, H. M. (2000). The Useful Plants of West Tropical Africa, Volume 5. Royal Botanic Gardens, Kew. Pendergrast, M. (2000). For God, Country and Coca-Cola: The Definitive History of the Great American Soft Drink and the Company that Makes It. Basic Books, New York. Davidson, A. (1999). The Oxford Companion to Food. Oxford University Press Inc., New York. Chevallier, A. (1996). The Encyclopedia of Medicinal Plants. Dorling Kindersley Ltd, London. Abbiw, D. (1990). Useful Plants of Ghana. Royal Botanic Gardens, Kew. Aubrév. Fl. For. C. Iv. 2: 242, t. 220, 8–10.